Forums Barth Journeys Bluegrass weekend in Arcadia. The 4th Saturday of every month is Bluegrass day at Craigs Campground, just a little north of Arcadia Fl. They have a large field for dry camping and a big stage with a covered seating area. The concert is Saturday afternoon, but there are jam sessions and workshops going on all weekend. This will be our first wintertime weekend out there and first time in the new-old Barth. So I think my wife is finally ready to take a trip south into the warm, perhaps leaving Iowa this weekend. I am thinking the Florida panhandle sounds pretty good. My wife does not camp in the RV so motels will be our overnight standard I guess. I would like to try and change her mind for at least a few nights, anyone know a really cool campground in the Florida panhandle area that might convince her to spend at least a night or two camping. Probably needs a restaurant nearby and maybe some entertainment. We will have our two dogs with us. Been to both recommend both friends have stayed and agreed. The Destin park is nice, pricey but we weathered a storm that shut down the world nearby and to the north we would have the only running water and bathroom on the highway for a hundred miles. The location is good as are the grounds. Choice depends on where you want to be. Duane, Here are some things for your bride to consider. The Florida Panhandle is less crowed. Panhandle may sound good but you won't get the warm feeling you will find farther south in the mainland of Florida . As far as the motel goes, it is difficult to park a motorhome in a motel parking lot. Motel parking lots are just not motorhome friendly. As far as staying in the motel, that is why I purchased a Barth. I do not have to deal with peoples germs left behind in the motel. What went on in the bed yesterday and what are the spots on the bedspread. With the Barth I said goodbye to the Flea Bag Hilton. I make friends with my next door neighbor instead of complaining their TV is to loud. The coffee pot in the camper makes coffee and was not a meth lab last night. The TV remote is not a germ infested breeding ground for the previous guest that picked there nose while searching for a station. Did I almost forget air quality? Nasty old Heating Ventilation and Air conditioning systems. My Barth has windows that open with screens and an 3 exhaust fans to keep air fresh. Your Barth at Walmart parking lot is cleaner than any of the above. Hey checked out your suggestions they look great. Not sure of our location yet but those will be in the decision making process. 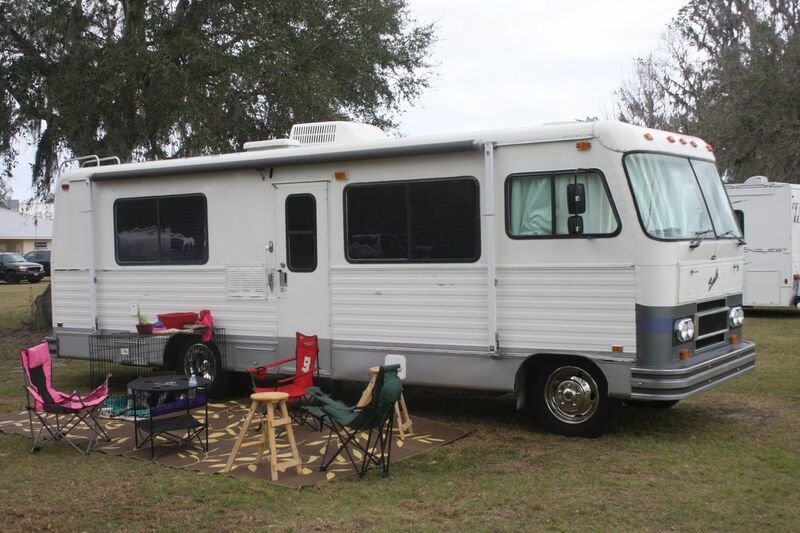 I saw a local RV park in the Destin area anything interesting there? That information should help thank you. Yes it will be a bit warmer further south, I lived for a few years in the Tampa area, but I think the 60's will feel great. One is in Destin, suggest joining Good Sams for the discounts as well as trip planning with location options. BTW you will never have an empty mailbox. There were several others in Destin but that one was our choice and after the experience it is our recommendation. What is your route south? We have recommendations for that as well, maybe. Give me a pm I have some other ideas. Well at the last minute my wife decided to back out of the trip to the panhandle...oh well I will keep trying....Thanks all for the help! Our site at the Bluegrass weekend. The wind was pretty stiff so the awning stayed furled. Steve that's what ya get for living in the Upper Popsicle. hee hee!!! We are green and brown, but not for long! I just got back from a ride around the area in the Glasnose, with the dogs and spouse, ya know I think I have this ole girl working pretty well at last. I still have to figure out how to get the window and screen rattles stopped. Any suggestions? I still have to figure out how to get the window and screen rattles stopped. Any suggestions? How would I hear the dogs bark, and my lovely spouse?? Also the purr of this throaty ole 454! Duane, foam pads stuffed into the tracks stops the rattles and helps absorb condensation running off the windows when camping in cool weather. Quick Reply Shortcut: Bluegrass weekend in Arcadia.